Los Angeles Die-In artwork created by Trudy Vinson. 49 people were killed on June 12, 2016 at the Pulse gay nightclub in Orlando, Fla. 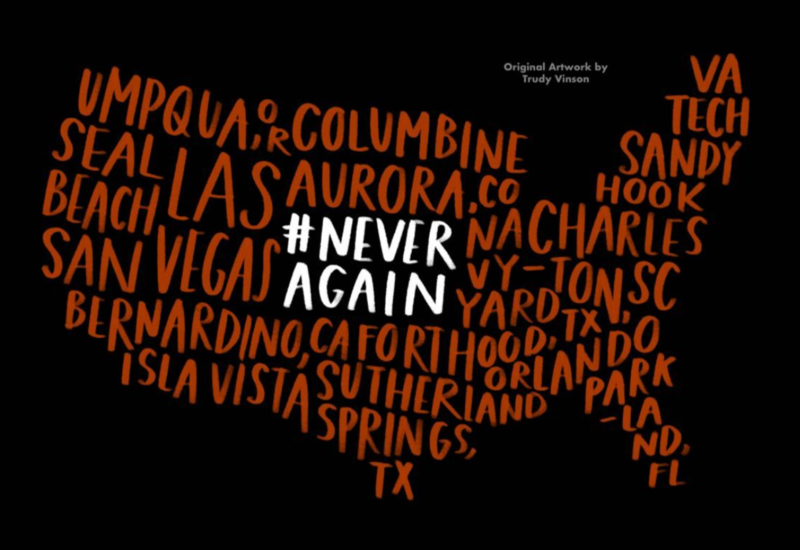 In the two years since, approximately 700 people have lost their lives to mass gun violence in the United States. To commemorate the Pulse victims and call upon politicians to enact gun reform legislation, student activists from the March for Our Lives campaign have organized a National Die-In Day for June 12. Die-ins entail protesters lying on the ground to physically represent the damage inflicted by gun violence. In Los Angeles, student activists are planning a 10:30 a.m. rally followed by a 12:00 p.m. die-in at LA City Hall. Student leaders, family members of gun violence victims, and activists alike will present at the LA rally. Alyssa Milano, an actress and activist, and Ron Galperin, Los Angeles City Controller, are also scheduled to speak at the event. “I will be attending the @NationalDieInLA on June 12th to continue to shine a light on the gun lobby choosing money over safety,” Milano tweeted on June 8. After the rally, attendees will drop to the floor for 12 minutes at noon. Those 720 seconds are intended to commemorate the estimated 700 people that have been killed in United States mass shootings since the Pulse massacre. Protesters are encouraged to bring signs, wear orange clothing to protest gun violence, and don pride paraphernalia. Volunteers will also be pre-registering people aged 16 through 18 and registering people over 18-years-old to vote at the event. Other organizations involved with the Los Angeles Die-In include the Women’s March L.A., Giffords (former House of Representatives delegate Gabrielle Giffords’ organization) and South Bay Coalition for a Better Tomorrow. Similar protests are being coordinated in several cities across the country, including Orlando, Florida and Washington, D.C.
LA Die-In co-head organizer and public relations coordinator Eve Levenson hopes that the day of die-ins brings renewed attention to the victims of gun violence. Levenson believes that sustained protests are essential to bringing about tangible legislative reforms. “We are still fighting, we still care about this, and we’re not going to stay silent,” Levenson said.